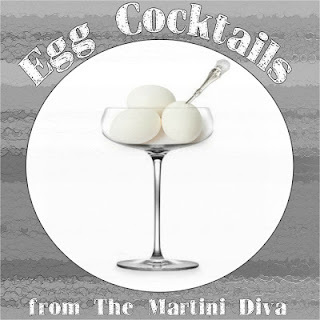 IT'S NATIONAL EGG DAY - Have an Egg Cocktail! Do more than cook with eggs - cocktail with eggs! After decades of being ignored and treated like a salmonella villain, eggs are making a comeback to the cocktail scene these days and a big hooray for that! Eggs can add a wonderful texture, a delightful foam and a silken quality on the tongue that nothing else can quite capture. Yes, there are powdered eggs and pasteurized egg products but they were never quite as good as the "real McCoy", a fresh egg. Eggs contain a protein called ovalbumin which breaks down when beaten or shaken (this is where you get all those lovely meringues from in desserts). In cocktails most eggs are paired with a sour element which will stop those proteins from binding together, making a better (smaller) foam for the cocktail.